Browser extensions or add-ons are bits of software to extend the features of your browser. Firefox browser has probably one of the most prolific numbers of extensions. We use quite a number of these firefox extensions for our daily grind. And we share some of the nifty add-ons here. You may already have a few extensions tooled up in your browser. You can check and modify their behavior all in one place. Just type about:config in the address bar and Firefox will share its internal details now – including the various extensions installed. You can right click on any of the parameter and modify its value. 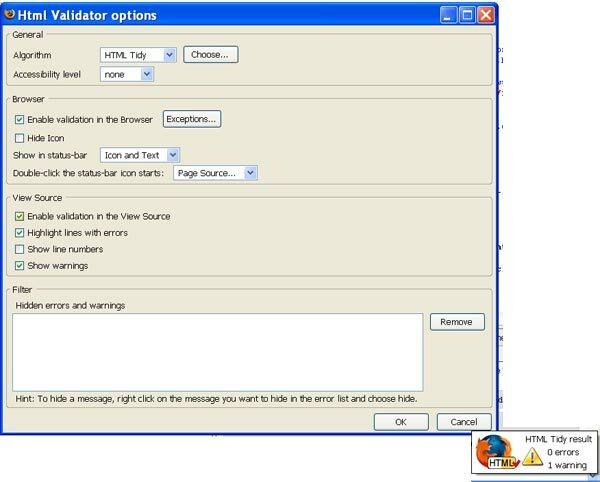 Though we use WDG HTML Validator for validating our pages, we like to use a quick way to validate the newly built pages right from our browser with a tiny validator. You head to this URL provided below for this Firefox Extension. Allows you to validate with Tiny validator from the status bar. For the Web developers, this is one of the most useful extensions to have to plod around to tweak the pages. That adds a menu and a tool bar with various web developer tools. Right from a spot magnifier which lets you view a part of the page magnified to viewing your page in lesser sized screens is available from the toolbar. Incidentally this extension also has an external page validator. This versatile add-on features response headers which lets you see the server response details. This is invaluable for checking out the status code of any redirection. This extension lets you query information like backlinks, cached and related pages from Google,Yahoo,MSN and Alexa. Hyperwords is another interesting Firefox extension which lets you do a host of things from its popup menu – “Search, References, Conversion, Translation , Shopping, Blogging, Tagging, Email and more in a single click“. We use the translate mode often as we have associates spread across the world. Simply block the text and you will find a popup menu with an option to translate the blocked text from most European languages (arabic, Japanese, Korean and Simplified Chinease languages included too) to English or the other way round. This entry was posted in Managing a Portal.